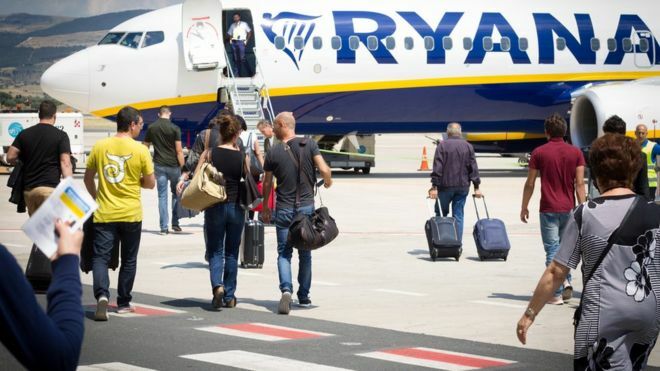 Italy's competition watchdog has opened an inquiry into Ryanair's decision to add new hand luggage charges. From November, Italian passengers wishing to take two bags on board will pay €6 (£5) for priority boarding. Those that do not will only be able to take on one bag that fits under the seat in front, with the second bag checked in at a cost of €8. Antitrust said hand luggage was "an essential element of transport" and should be included in the ticket price. Some travellers only carry their 10kg (22lb) standard "wheely" bag. Ryanair spokesman Kenny Jacobs said: "We look forward to co-operating with this Italian inquiry. All Ryanair customers are free to bring one piece of carry-on bag onboard. But no airline customer has a right to unlimited carry-on bags." UK rules applied by Ryanair allow passengers to take two pieces of hand luggage into the aircraft if they have paid £5 for priority boarding. If they have not paid that charge, the second bag is put into the hold - albeit without being charged as checked luggage. Antitrust said Ryanair's new Italian policy could amount to unfair commercial practice in that it distorts the final price of the ticket and does not allow a true comparison with other airlines' prices.